The Inhumans have been a tough nut for Marvel to crack. 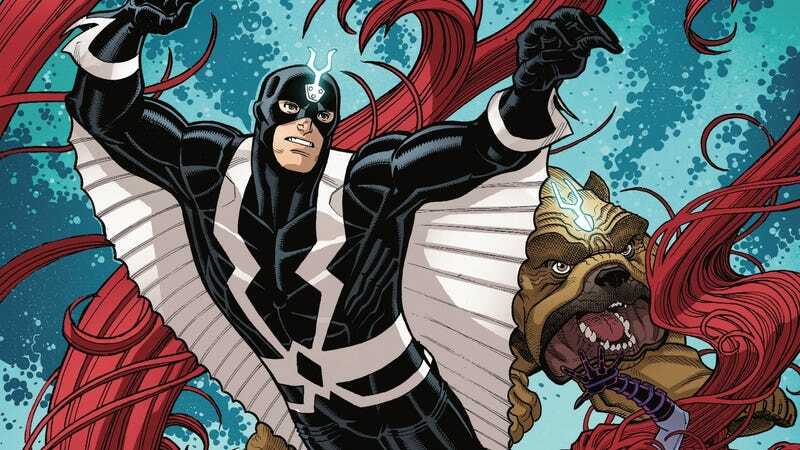 Marvel has spent the last four years pushing the Inhumans in comics, but after the failure of the recent Inhumans TV miniseries, it seems like bigger plans for this franchise are dead on arrival. Which is a shame, because Inhumans comics are the best they’ve ever been at the moment. Christopher Priest and Phil Noto are showing Hollywood how to create an accessible, engaging Inhumans origin story in Inhumans: Once And Future Kings (OFAK), and for the new Inhumans fans created by the miniseries, this title is a smooth bridge into the characters’ comic-book adventures. Like Priest’s Deathstroke, Inhumans: OAFK is about family, and the emotional foundation of the book is in the relationships children have with their parents and siblings. This exclusive preview of next week’s Inhumans: OFAK #5 highlights a young Black Bolt’s very different dynamics with his mother and father, starting with a rose-colored scene where a baby Black Bolt is protected by his mother after his cries obliterate the royal palace. Noto makes excellent use of center positioning in this excerpt: the first page has Black Bolt’s mother running toward her son, who is at the center of the last three panels. He’s actually at the center of everything, an idea reinforced by the following splash page that shows Black Bolt and his mother at the center of the circle of soldiers, surrounded by rubble on all sides. He returns to center-panel for the next scene with his father, and cold close-ups of Black Bolt’s face bookend the page to show how his attitude has intensified since his innocent infancy. Inhumans: OAFK is also about a kingdom built on the backs of slaves, showing how the Inhuman teens become players in a growing slave revolution. The Alpha Primitives have always been one of the most discomfiting elements of Inhuman mythology, but this book is using them to discuss the immorality of slavery and the right for oppressed people to rise up. Priest and Noto have been doing all of this while delivering a very fun superhero story that has gone in some unexpected directions, like the comedic Spider-Man mind-swap in last month’s issue. All this, plus adorable Lockjaw back-ups by Ryan North and Gustavo Duarte, who take Lockjaw around the Marvel Universe for comic-strip-style antics. (Lockjaw is J. Jonah Jameson’s Ghost of Christmas Future this month!) Inhumans: OAFK concludes this week, but if Marvel’s looking for a creative team to launch a new Inhumans ongoing, they have two proven partnerships in this title that should get the opportunity to keep creating together.